Children just love to throw things don’t they? Anything from a bouncy ball to a tantrum! Throwing is actually great for children. Throwing helps with hand/eye co-ordination, timing and balance. Having said that, children who continually throw things can be really frustrating for us adults! “Don’t throw this/don’t throw that!” but how can our youngsters learn to throw objects safely with our hurting themselves, others, or driving you around the bend?! There is a new toy available named My Mood Stars. My Mood Stars are eight super soft plush stars depicting different moods and emotions, Sad, Happy, Shy, Angry, Worried, Surprised, Silly and Sleepy. I developed My Mood Stars to help children identify their emotions and those of others. My Mood stars encourage children to open up about their feelings through play. Children engage with my Mood Stars and talk to them. A keen adult ear can tune in to conversations that children are having with the Mood Stars and jump on anything that may be troubling the child, or indeed the child feels happy and excited about! My Mood Stars also help develop empathy, with children relating sympathetically to Sad Star, and Shy Star. So, what has all this got to do about throwing? The lightbulb moment for Catch a Falling Star came to me when I was selling My Mood Stars at an event. 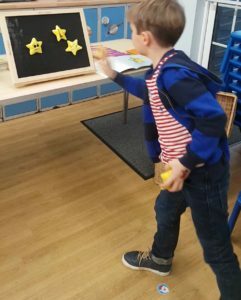 The Mood Stars were stuck to their My Mood Stars board when one of them randomly fell of the board and was kicked away by a six-year old would be Gareth Bale! Would be Bale hurled the Mood Star back in my direction, and it landed back on the board …stuck almost where it had fallen off! “Again!” cried the six year old and he came to retrieve the Mood Star. Kids were queuing up! Not just Early Years kids, great, hulking nine and ten year olds! So, Catch a Falling Star was born. Since that first game was invented, I have played the “Catch a Falling Star” game (formerly the highly unimaginative “The Mood Star game”) at every event that I’ve attended. The game has evolved slightly and the thrower has to name the Mood Star that they throw onto the board. If they drop a Mood Star or miss the board, they have to act out that Mood Star’s emotion! That’s the general rule. Obviously if a little four year old bursts into tears at the very thought – that’s quite enough emotion for all involved! I was at a Christmas Fair today and was recognised as The Mood Star Lady! This child was about ten years old, and had remembered me from a previous event. Covered from head to toe in mud from a rugby match, he grabbed a handful of Mood Stars and proceeded to hurl them at the board! Schemas are a pattern of play. As children develop and grow, so do their schemas. A trajectory schema involves an interest in movement of things and of self. Throwing is a trajectory schema. We can blame trajectory schemas when very young children drop things from their high chair “Oh no! It’s that bloomin’ trajectory schema again!” as we pick up a piece of soggy toast for the fortieth time! Things that can help a child with a trajectory schemas is catching bubbles, playing with running water, providing objects like toy cars that they can push along in a line. As soon as a child is old enough, around five to six years, he or she can play “Catch a Falling Star” with My Mood Stars at home perfectly safely. But how do the Mood Stars stick to the board? A great question! I didn’t want to take away the sensory aspect of the Mood Stars by adding a piece of Velcro to them. So the backs of the Mood Stars are made from Tricot materiel that sticks to the black, woven-hook materiel on the board. 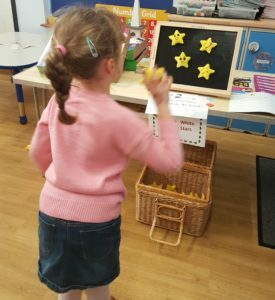 So I just thought I’d throw in a little bit information that you may not have appreciated about My Mood Stars – they are a brilliant toy for hand/eye co-ordination, balance and timing and they get children thinking about emotions at the same time!